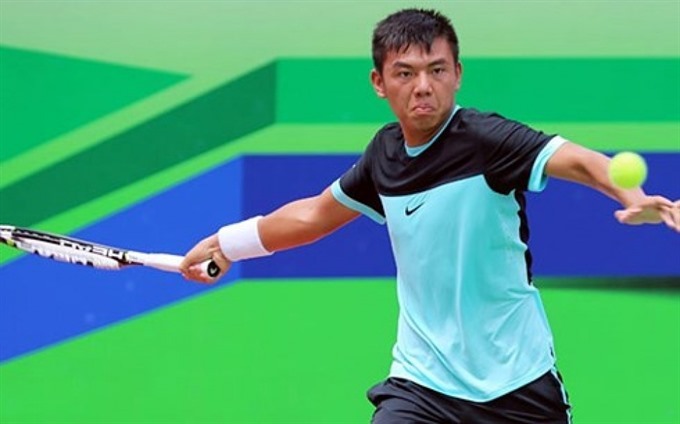 HÀ NỘI — Top Vietnamese tennis player Lý Hoàng Nam won the first round of the Việt Nam F3 Men’s Futures tennis tournament in the southern province of Bình Dương yesterday. Nam, world No 522, beat Miguel Diaz of the US, world No 1,608, 6-3, 6-1 in the men’s singles match after one hour and 15 minutes. Nam, who finished second in the F2 Men’s Futures event, was in complete control for the two sets. Nam will next face Diaz’s teammate Lu Tyler, world No 994, in the second round. Two other Vietnamese representatives failed in the first round. Vũ Artem lost to Arjun Kadhe of India 1-6, 4-6. While Michael Look of Australia beat Phạm Minh Tuấn 6-2, 6-4. In other news, Sho Katayama of Japan crushed his teammate Keisuke Numajiri 6-4, 6-4. Andrew Harris of Australia bested Ivan Mikhaylyuk of Russia 6-1, 6-0. Tyler Lu of the US beat Tsung-Hao Huang of Chinese Taipei 6-3, 6-3. Rio Noguchi of Japan defeated Brian Tran of Australia 6-1, 7-5.